"But the goblins were there. They could return. He said so bravely, and that is why you can trust Beethoven when he says other things." 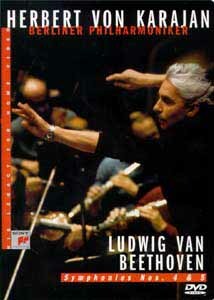 The third in Sony Classical's series of von Karajan Beethoven symphonies on DVD is without a doubt the best to date. The performances, recorded in 1982 and 1983 for laserdisc release, are brisk, powerful and moving. These recordings are not presently available on CD. While von Karajan fails to take repeats in the 1st and 4th movements of the Fourth (no doubt a concession to the abbreviated running time of laserdiscs), to my astonishment and delight he DOES take the often-disregarded repeat of the first movement of the Fifth. This alone would merit four stars in my book. Image Transfer Review: The video features the same understated array of colors (black, white and brown) as on the other DVDs in the series; the picture is occasionally soft, but there is so much double exposure going on that that is seldom an issue. As always, the camera moves often, focusing on different instruments in turn. Audio Transfer Review: The DVD features both a stereo PCM soundtrack and a Dolby Digital 4﷓channel. Unlike the first two disks (symphony no. 9 and symphonies nos. 2 & 3), the balance and mixing problems are eliminated on this release. The bass is powerful but not overwhelming, and the timpani is prominent but not too forward in the presentation. While the 4-channel version is to my mind more involving (it is also louder by a fair bit), the PCM stereo version is quite good as well. Neither one will disappoint. The lack of a subwoofer track is not too serious a defect if one has good main speakers. Extras Review: The extras are limited to a text biography of von Karajan and notes on the symphonies. These extras are presented in English, German and French. This disk is the first in the series which I can recommend without any hesitation whatsoever (except to those who are offended by the lack of repeats in the Fourth). The performance and the sound quality are a sheer delight. The Beethoven lover should immediately buy this DVD.